Family Historian 3.1.2 was released last month. Family Historian is a Windows genealogy application, and is available in the UK, Australia, and New Zealand. A download purchase may allow you to buy it in other countries. * You can now specify the size of margin to leave around diagrams when saving a whole diagram in Enhanced Metafile Format (EMF). Also, the problems that some users experienced when saving diagrams in Enhanced Metafile Format have now been fixed. * Now, if you have Windows XP or later, you can access the contents of Family Historian’s backup (zip) files using Windows Explorer. Note: It is highly recommended that Version 3 users upgrade, as well as 3.0 users are especially recommended, due to numerous enhancements since the original 3.0 release. 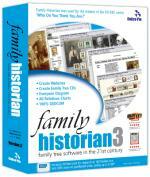 It’s official, Family Historian 3.0 is now shipping. We heard a few weeks ago that it would be shipping at the end of march/beginning of April, and low and behold it is. This is the Windows genealogy software used by the producers of the popular BBC genealogy series, Who Do You Think You are? We have a story from November detailing what’s new in Version 3.0 as well as you view the official information at family-historian.co.uk. This is a very extensive upgrade to Family Historian. Version 2.0 users will be able to purchase an upgrade for 3.0. – A new method of branch dragging relative to a â€˜fixed pointâ€™ makes it easy to move entire branches apart or together. The same technique can used to move spouses and siblings together or further apart. – A new Everyone Diagram has been added which shows everyone in your family tree file, and all of their relationships. Family Historian 3.0 from Calico Pie, LTD, will be available at the end of the month in the UK, and will take a little longer to reach distribution outside of the UK. This is both the boxed version and the upgrade CD version, and the date is expected to be March 28th. With this release of the genealogy program, they are dropping support for Windows 95 and Windows NT, for technical reasons. It runs on Windows 98/ME/2000/XP as well as 64-bit versions of Windows. You can read about some of the new things in 3.0 in a story we posted back in November here. News via the Family Historian User Group website.